Our second night in Seattle, we met a friend (SF) for dinner. It was kind of last minute. 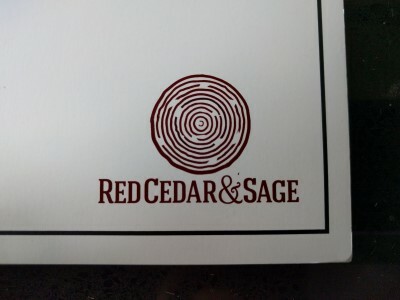 We had made reservations at Red Cedar & Sage in Pike Place Market and then SP & SF finally reached each other and SF decided to join us for dinner. I was surprised that we were the only people in the restaurant and it remained that way throughout the evening. 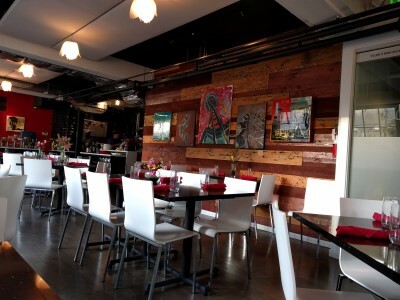 Maybe no one dines out on Sunday in Seattle? Maybe they eat much later than 6 pm? After poking around a bit, I think maybe they opened not too long ago and since they're kind of tucked away in PPM, maybe not too many people know about this place? At least, it seemed tucked away to us but we aren't too familiar with the layout of PPM. It took us a bit of looking around to figure out where to go/how to get to it, and yes, there is an elevator so it is wheelchair accessible. Inside is bright, spacious, lots of windows. Lots of wood and white & red. We sat next to a window which was nice. 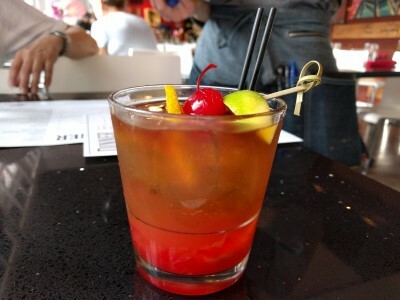 While SP & SF chose wine, I opted for a cocktail: Not Your Papa's Old Fashioned (Bourbon, Muddled Lemon, Orange & Cherry with Cointreau and Orange Bitters). I wish I'd chosen wine. I didn't like this at all. It was just too strong for me and whatever bourbon was used, it wasn't to my liking. I ended up swapping drinks with SP. 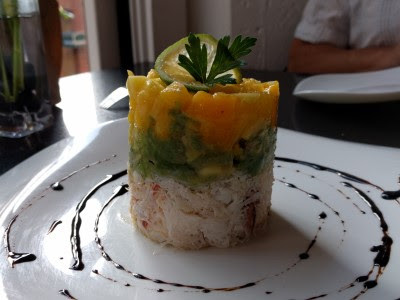 For an appetizer, the 3 of us shared Crab Stack (Dungeness Crab, Avocado, Cilantro, Fresh Lime, Mango, Citronette Dressing & Balsamic Dressing). We've had this, or similar dishes, before, and this was a good version of the crab stack. For my meal, I chose Short Ribs (Red Wine & Orange Braised, with Parmesan Basil Mashed Potatoes, Grilled Asparagus, Red Wine Vinaigrette). The description said asparagus, but I didn't receive asparagus. I think it was broccoli, or broccolini. This was quite tasty. 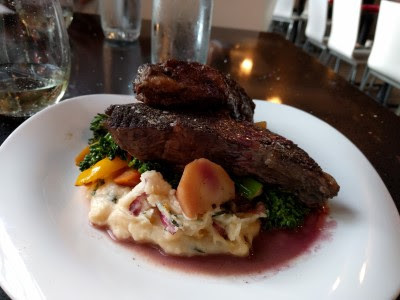 A large portion of tender short rib. Delicious potatoes. I couldn't eat it all so I gave the leftovers to SF. 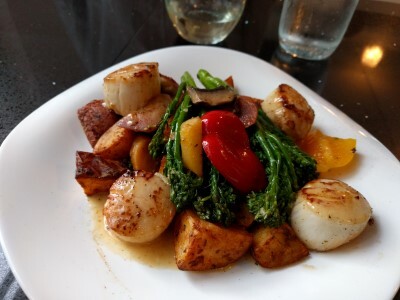 SF chose Scallops (Pan-Seared Scallops topped with a White Wine & Lemon Cream Sauce). He said they were very good, cooked nicely and the sauce was yummy. 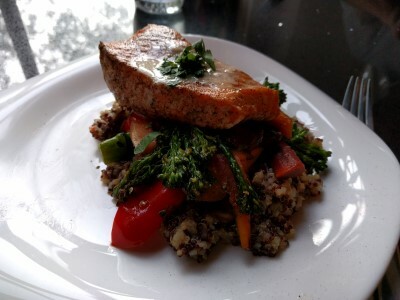 Not surprisingly, SP chose fish: Cedar Plank Salmon (Red & White Quinoa, with Red Onions & Peppers, Kale, Lemon Beurre Blanc & Roasted Vegetables). It was a nice portion, cooked nicely, and he liked the quinoa and veggies with it. For dessert, we shared Tiramisu. 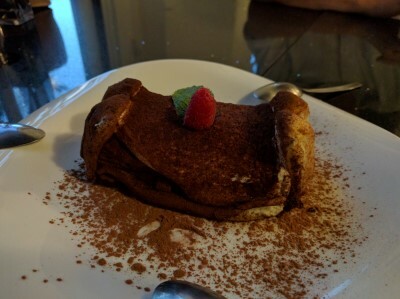 It was not what I expected but it was a tasty version of tiramisu and it was not too dense & filling. We all enjoyed our food at RC&S. SP & SF were able to easily finish their food, but my portion was too big for me, so I'm not sure if the actual portion was larger or if I wasn't really hungry or if beef is just more filling. Our server was young but friendly and checked on us frequently to make sure everything was good and we had everything we wanted.